Wait, are we still doing this? We are? Oh, okay. Well, this is the last of it. Or most of the last of it. While a few items remain in the box o' Japanese food, this premise has overstayed its welcome, and really, we've had enough squid. But hey, there's a new batch of interns to break in, and we have some octopus treats, seaweed, and chocolate-covered shrimp crackers. Then there's the Crunky candy, curry-fry snacks, chocolate french fries, chocolate beer (uh, from Oregon), a curry drink, and "vanilla salt" donuts. Good thing we still have some Hint Mints left over from the All Candy Expo. 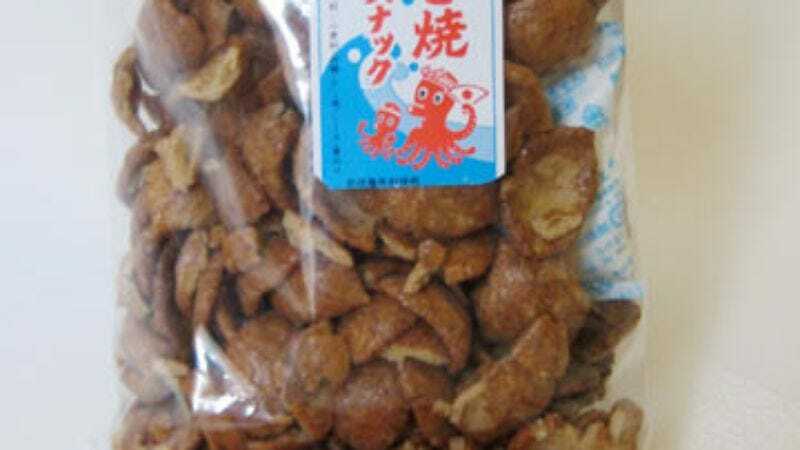 The tasting began with some octopus-flavored crisps, which had the airy texture of ricecakes. They didn't look like they were made from octopus, so we debated whether octopus flavorings were just added later, or the octopus had been processed into oblivion to look like circular Fritos. Flavor-wise, they were neither offensive nor intriguing; it mostly came down to texture, and these had a pleasant enough crispness. Nothing topped the curry-fry snacks in that department. With the consistency of Funyuns, they were 99 percent texture, 1 percent taste. Okay, maybe 3 percent. Again, not bad, but empty calories need something more than crunch to justify them. To accompany the curry fries, we popped a bottle of chanmery, a sweet, non-alcoholic drink with the lightness of sparkling cider. It's apparently popular in Japan and comes in a variety of flavors. We tried curry flavor; it sounds potentially gross, but the taste was undeniably cider-like, and the curry flavor was subtle to the point of non-existent. Oh, but there was no denying the flavor in the seaweed and Ebittcho, the shrimp-and-chocolate treats. The former had a biting saltiness topped only by its overwhelming fishiness, and it went down in flames in tasters' reports. The latter didn't fare too well, either. In the Far East, maybe sweets and seafood intermingle like yin and yang, but the flavor combination was pretty jarring to the Westerners at The A.V. Club, who couldn't imagine why shrimp and chocolate ever needed to co-mingle. What about salt and vanilla? Well, that's also odd, but not in the same league. Ribon's "salt vanilla doughnut" featured 10 mini-donuts to the pack, not unlike their chocolate and powdered-sugar cousins found in every gas station in the U.S. These were simple cake donuts, but with the sweetness ratcheted up, thanks to the copious vanilla salt, which is similar to the stuff Starbucks has next to cocoa and cinnamon. The donut's denseness and dryness made eating a whole pack seem like a bad idea. You know what else is a bad idea? Combining chocolate and french fries. The idea isn't a new one; in 2002, Heinz introduced its Funky Fries line, which included Cocoa Crispers, a chocolate fry. (They didn't catch on, and were pulled from the shelves a year later, according to a CNN story about foods that flopped.) But those fries were frozen, and these "Choco Frites Au Lait" promised "BELGIAN QUALITY" on the label. Sadly, these fries are all trompe l'oeil: Although shaped like french fries, they are instead filled with a hazelnut paste, not fried potatoes. That's good, because the mind boggles at the insane amount of preservatives needed to accomplish such a feat. Those Belgians aren't miracle workers, you know. Neither are the Oregonians at Rogue Ales, who export Chocolate Bear Beer to Japan. It tastes like a dark-chocolate bar mixed with a bitter ale, and it looked like chocolate syrup with carbonation. It was good in small doses, but it's a sipper, not a gulper—and the longer it sits warming to room temperature, the less palatable it becomes. You know what else isn't palatable? A bizarre Little Black Sambo-esque blob for a mascot. But there he is all over a tube of Conguitos, a sort of M&M;'s knockoff of chocolate-covered peanuts. There's the free lil' bobblehead sitting atop the tube, the giant cartoon of him on the side, and his adorable, big-lipped face on every Conguito. (They're separated into two colors: brown and white.) He beckons you as if to say, "Why hello dyah! Isa bet you likes you some sweet, sweet chocolate! Ooooooooohhh mammmmmmy!" But cast no stones, racism hounds—Conguitos also has a white version of its little mascot. See, they're not insanely racist. Right? Right? Turns out the company that makes these lil' abominations isn't Japanese, but European. Portuguese, to be exact, and it has a long history of offending people. Not that it seems to bother the candy's manufacturer, LACASA. The candy's slogan: "You'll recognize them by their face. Only Conguitos have the Conguito face!" Well, it has a point there. To flush out this sweet, sweet racism, we finished with some Crunky popjoy. (Now friends of Lil' Jon traveling to Japan will know what to get him for a gift.) Word on the street foretold of the Crunky's deliciousness, but one look in the package didn't bode well: These little chocolate nuggets glistened like glass, which was a dead giveaway for the waxy chocolate that lay at their core. Inside was a mix of chocolate and rice, which drew immediate comparisons to Krackel. But even Hershey's uses better chocolate than these heartburn nuggets. — "It's good. It's light and puffy—and tentacle-y." — "It tastes like a caramel rice cake." — "I think they just brushed puffed rice with octopus essence." "Yes, I'm getting the essence." — "Not being familiar with octopus, it tastes kind of ribby, like barbecue. But it has a weird aftertaste." — "It makes you want to eat something else." — "That is a phenomenal crunch." — "It's like a stale fry." — "They're like Funyun sticks." — "This is a very cheap imitation of curry fries." — "The curry flavor is really, really light. I could see drinking this with a meal. It's a good palate-cleanser." — "It has a very sour orange flavor." — "It smells like apple—like liquid Jolly Ranchers." — "I'm not really getting a curry flavor." — "I would drink this if it had actual booze in it." — "I think it looks like a Jolly Rancher that's melted." — "Oh good lord, that's terrible." — "It's like eating cellophane." — "Wow, no one should eat this, ever." — "It's like foul-tasting cellophane." — "It'd be interesting to wrap something with it." — "I like it, actually; it's so thin, but it's got a nice saltiness to it. The seaweed taste is not overpowering; it's fairly subtle." — "I don't know. I still taste the [seaweed]." — "The shrimp flavor doesn't come on until later, then it comes on strong." — "Yeah, uh, I don't like shrimp." — "How do they get the shrimp in the crunch form?" — "It's like a KitKat bar, but in really, really light form." — "I don't know what I'm tasting here." — "You don't taste it until like 30 seconds after you eat it—another terrible aftertaste." — "God man, it's—ahh—dry as hell. The salt of course absorbs any kind of moisture; it's counterintuitive to put salt on a donut. It's also sort of a cake-style donut but it is super-sweet." Minutes later: "Just a status report on that donut: It's continuing to absorb whatever moisture I had in my mouth." — "This doesn't really taste like anything." — "You don't get the salt so much because the sugar is so overpowering." — "This tastes like sugar-cookie dough that's been left out." — "It's just chocolate; it's not bad. It's really just chocolate and peanut butter." — "It's like a delicious peanut-butter cup in a greasier shape." — "It tastes like Easter candy that you've let sit for three Easters." — "It tastes like generic, no-name chocolate Easter eggs, with a chalky consistency." — "The chocolate so overpowers it that you wouldn't know there was anything else in it, but it's not good." — "I actually really like this. You really can't make beer or chocolate too dark for me." — "It's really good. It doesn't taste like chocolate, much more like a port." — "It's more like Coke with chocolate syrup. It's like a beer and a chocolate soft drink." — "Wow, that really is horrible." — "The beer is the tastiest thing I've had." — "Could something taste racist?" — "It's quite good. We're all behind racism!" — "If the KKK handed these out as a recruiting tool, recruitment would go up… because they're delicious!" — "The white ones have a yogurt taste." — "This is like a giant Krackel; it's delicious." — "Oh, it's weird. There's a different foretaste than the aftertaste—it's like caramel-y." — "Yeah, they taste a little like caramel Nestlé Crunch bar." — "Ugh, the chocolate is awfully waxy." — "Crunky popjoy? It's lacking joy, however. And it didn't really pop." Where to find them: In the U.S., Rogue Ale's Chocolate Bear Beer is known simply as Chocolate Stout, which is available in a limited supply, according to the website. The others? Japanese specialty stores–a good one is JList–and eBay.